In addition to providing vision exams and prescriptions for eyeglasses, our Danbury and Stamford optometrists specialize in contact lens fitting and dispensing. Dr. Ivan Wong & Associates strive to make your visit convenient, fast and efficient and therefore, we offer every contact lens patient a pair of trial lenses on the day of the exam. Our contact lens specialists work with each patient to find the pair of lenses that offer optimal comfort and ease based on your individual vision specifications, lifestyle and preferences. We specialize in difficult to fit lenses and stock every brand of contacts available in the US to make sure you find the contacts that are right for you. Need contact lenses in Danbury, Stamford or the surrounding areas? No need to come in special to place an order. Order your contacts online here. You are welcome to visit our Stamford and Danbury offices to get a first row view of all of the contact lenses brands and products we carry. Ready for a new look? Whether you wear corrective eyewear or not, tinted or specialty lenses can be a fun and funky part of your personal style. People with astigmatism, even considerable amounts of astigmatism, can wear contact lenses. Around the world, millions of people with astigmatism wear toric (soft) contact lenses every day. Continuous wear contact lenses (Silicone Hyrogels) are an extension of extended wear contacts but Instead of being limited to only 6 nights they can be worn for up to 30 nights. 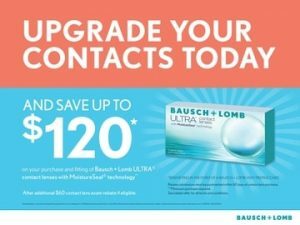 Designed to combine the innovative 3-Zone Progressive™ design with the excellent end-of-day comfort of Bausch + Lomb ULTRA® contact lenses with MoistureSeal® technology. Dailies Total1® Multifocal contact lenses are designed for people with presbyopia and are intended to be used on a daily disposable basis. The contact lenses are available with a power range of - 6.00 to + 3.00D and three ADD powers (Low, Med, High). If you need correction for presbyopia but dislike the idea of bifocal eyeglasses, you have many contact lens options available at our Stamford and Danbury offices.